The owner of TopSurvivalPreps is a survivalist and has been prepping extensively for almost two decades. We own and use the majority of these items. If it’s on this site, that means we are confident to use it ourselves. Many of the items on this site have links to Amazon. You pay nothing extra and we get a small referral fee that helps us build and maintain this site. Help keep us the #1 ranked prepper website! The Ronco Pocket Fisherman Spin Casting Outfit is a compact fishing rod & reel set that should be included in your survival Bug Out Bag as part of your survival plan. There's an old saying that the best fishing rod is the one you have with you at all times. That can be no more true than with this outfit if you have one with in your vehicle or in your backpack Bug Out Bag. 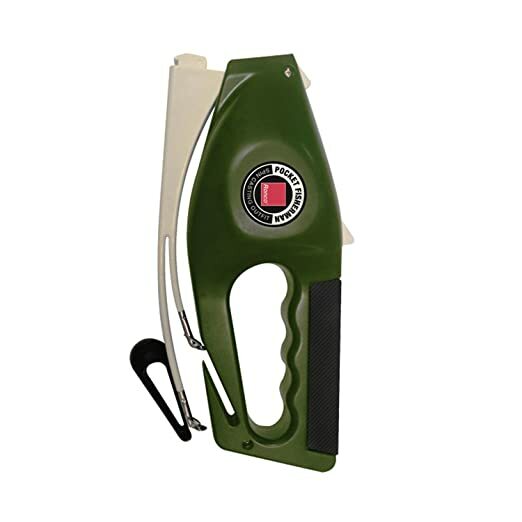 The original Popeil Ronco Pocket Fisherman has been around for decades and is perfect for hiking, camping, backpacking, survival, SHTF, and is great for Doomsday preppers. Being such a compact rod & reel, you can cast it in crowded areas (around and under bushes & trees where a normal pole would be difficult to manage). Most people can easily cast approximately 50' to 60' or more. The handle serves as built-in storage that holds several items including extra hooks, weights, bobbers, etc. The double-flex rod can be hinged into closed position when storing it to make it more compact. Simply unfold from this position until it snaps into fully extended position and you are ready to fish again. There is an automatic Anti-Reverse that prevents the handle from turning backwards. This outfit comes with at least 30 yards of 10 lb test mono-filament line, 2 bonus lures and has a belt clip to attach to your belt. The Ronco Pocket Fisherman Spin Casting Outfit is fine for fishing in the ocean for smaller fish. You can also try 20 lb. test line. If you take a tackle box or bag with you, include some 10 lb. and 20 lb. test line. See the recommended accessories below. The following YouTube video is a commercial for the Ronco Pocket Fisherman. "They work better than expected. Nice for survival bag." "Well-built and fish-ready, just like I remembered." "I purchased on for myself and several as gifts. It fits anywhere and casts as simply as it looks. The handle serves as built-in storage that holds several items including extra hooks, weights, bobbers, etc. For the price this is a steal! Its fun, turning a 5 inch brim into pure excitement for my sons. It's light, but feels substantial so no local freshwater fish will cause it to break." "Had one a long time ago. these work well." "Just a great product. Caught 13 bluegills first time use. Would recommend. Great price and lot's of fun." "It's smaller than I had imagined but perfect for a portable fishing system, bug out bag and easy to store on my boat for when I crappie fish." "I recently purchased 2 of the Ronco Popiel Pocket Fisherman for me and my girlfriend from Amazon and since I received them in October, 2009 I have made about 10 fishing trips and have caught lots of fish of various sizes. They work perfectly and are worth every penny. I fish on the shores of our local beaches in St. Vincent in the Caribbean and the casting is perfect since I adjust the sinker to accommodate the heavy surf. Where I fish there are lots of Permits & Croakers and they put up a real fight, the pocket fisherman has done its job so thus far... I would most definitely recommend this product to anyone with fishing as an interest." "Bought 2 of these for when my mom and I go out on our motorcycles. It fits under the seat easily. I also found that you can cast in crowded areas(bushes trees)that a normal pole would never work in. My first catch I landed a 5lb bass on this tiny rod and reel and it handled perfectly. It isn't a top of the line product but, it works very well for what is it. Bought one for my dad as well." "I've been aware of this item for years and was skeptical. Actually it's very nice. I wanted it for my kayak .. Small and easy to take along. I was so pleased I bought a second one." "I love this fishing rod. It goes everywhere and can handle light nibbles to reeling in the big ones. Never would have believed it if I hadn't used it myself, so I gotta go ahead and recommend this item!" "Like cameras, the best fishing rod is the one you have with you at all times. This little fella slips under the back seat of my truck and works well beyond my expectations. It came with some decent lures. The wife and I have caught half a dozen small bass with it and it handles them with ease. Folds up when done and the lure goes in the handle to keep from stabbing someone by accident." Share This Page On Facebook!